Happy Thursday! 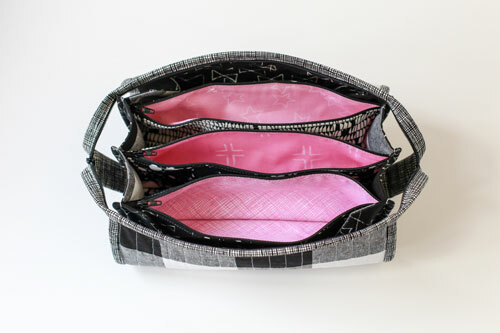 Today I have my latest Sew Together bags to share. I just can't stop making these bags. I love to give them as gifts, and I made and gave these both in December. 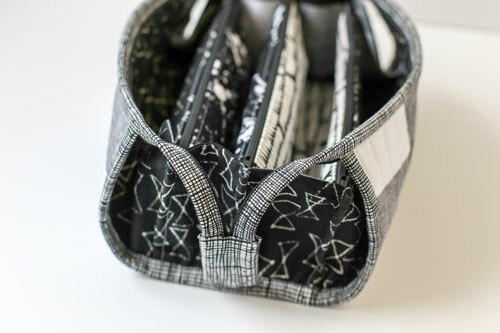 See the other sew together bags I've made here: Dreamin' Vintage Sew Together Bags, Nordika Sew Together Bag, Geometric Bliss Sew Together Bag, Carolyn Friedlander and Paris Map Sew Together Bags. Sew Together Bag pattern by Sew Demented can be found here. All zippers are from Zipit. The first bag I made for my friend Holly. She loves black and white, and we bond over our mutual love for purple. 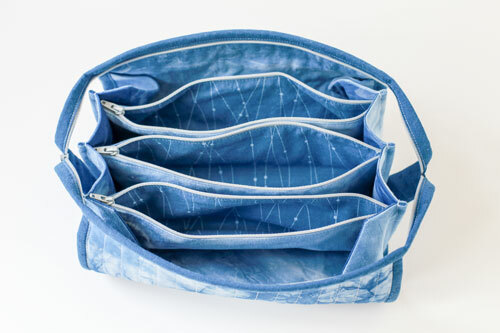 I knew I wanted to use one of the purple prints from her Brushstrokes fabric collection in her bag. I decided to use the purple only inside the pockets. 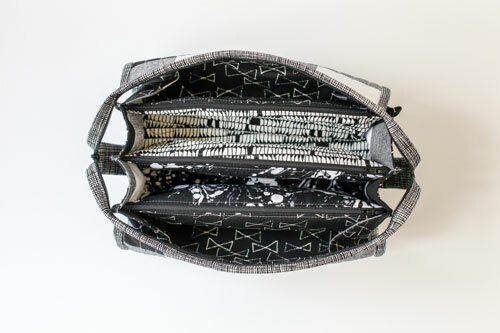 So the entire bag is different black and white prints, except for the pocket linings. I used the 2" gingham from Cotton and Steel for the exterior. 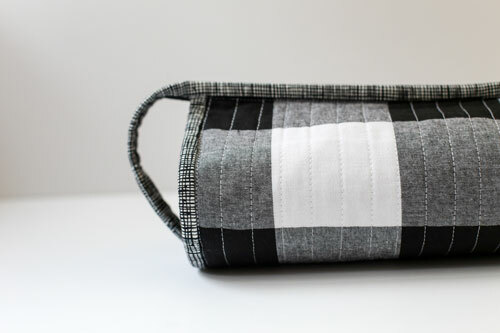 I had fun digging through my black and white fabrics for this bag. The second bag I made for my friend Anna. 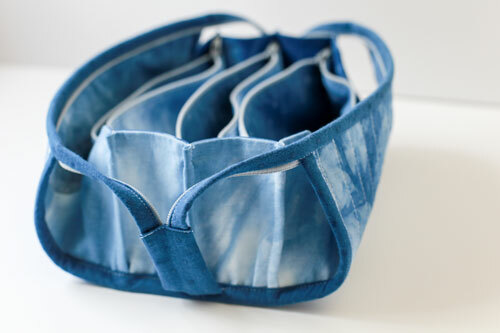 Last Summer she tried indigo dyeing at our annual retreat, so I thought she would appreciate a bag made from some indigo dyed fabrics. 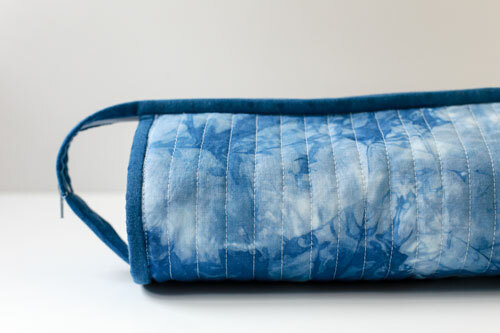 It was a great opportunity to use some smaller pieces of fabric I've dyed over the years. 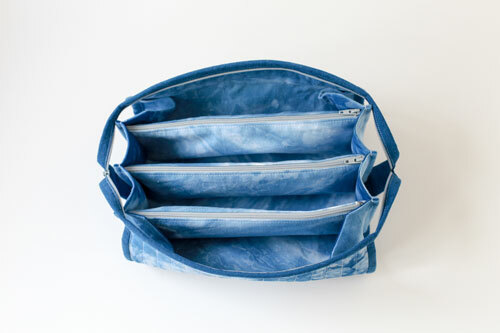 I used dyed kona cotton fabrics for the inside, sides, and exterior. The pocket linings are a dyed white on white print, and it's bound in a textured cotton dot fabric. 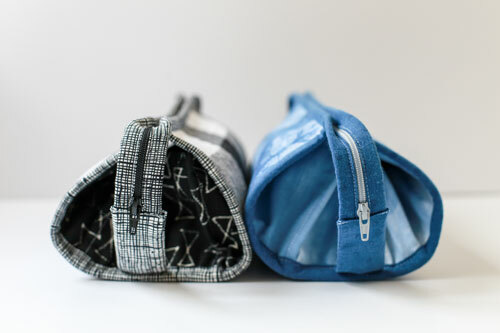 I'm sure these won't be the last sew together bags I've made! At this point they come together pretty quickly, without too much trouble. Love your bags. I made a few, but always have trouble with the binding. Lovely bags. I've just started my own. Die sind einfach klasse und so vielseitig verwendbar. One day I would love to make a few of these for my daughters and beloved friends. I just adore all the fabrics you put together. Lucky friends!